Marco Solorio of OneRiver Media will be one of the guest presenters and panelists at the next Digital Cinema Society event, November 19, 2016 at Raleigh Studios, Hollywood in the Chaplin Theater (2pm to 5pm). This event is open to all but you MUST register in order to gain access into the studio lot and theater. 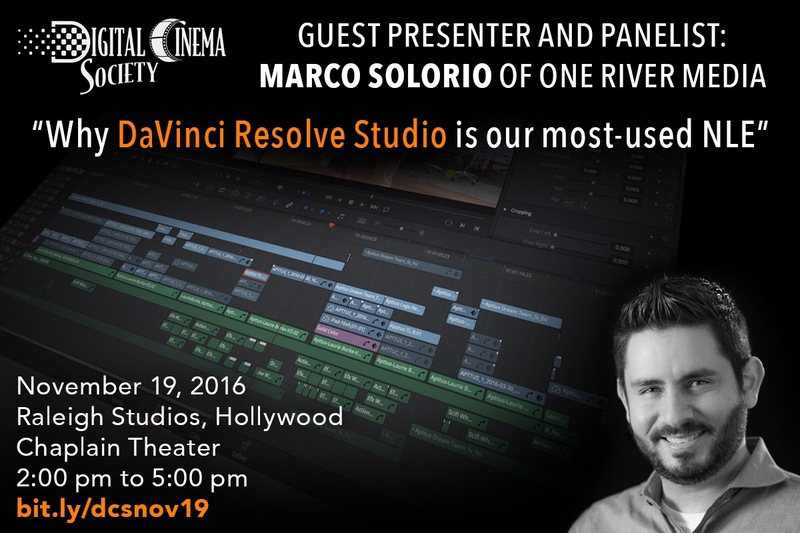 Marco will be discussing his use with Blackmagic Design’s DaVinci Resolve Studio as OneRiver Media’s most-used NLE (non-linear editor) for the last year and how it has dramatically saved time and cost while maintaining accuracy within the production and post-production workflow. Hope to see you there!